(Astoria, Oregon) – You can dive into regional history and help make history, all while having a beer at two north Oregon coast events. One is a major beer festival that keeps growing every year and the other a historical presentation at a local brewpub. (Photo above: Fort George Brewery in Astoria). Oregon videographer and historian Darrell Jabin returns to the north Oregon coast town of Seaside, for a gathering called Unique Oregon Stories at Seaside Brewing on January 28. Darrell has produced videos on 100 years of Oregon history through the Oregon Blue Book, Oregon Carousels, Oregon Amusement Parks and Theaters of Oregon. His videos have played on 10 public access stations and are in 30 libraries. He has provided more than 200 presentations and is currently working on a video of rail history of Oregon. It's all part of the History and Hops presentations at the brewpub, which are put together by the Seaside Museum. 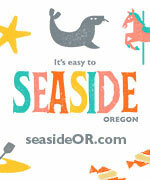 The event starts at 6 p.m. 851 Broadway St., Seaside, Oregon. (503) 717-5451. On February 13, look for a brewfest of epic proportions on the north Oregon coast. Fort George Brewery in Astoria hosts its Festival of Dark Arts, a one-day carnival of stouts. Immerse yourself in this magical menagerie of dark art and macabre entertainment, where you'll also be surrounded by the boldest collection of rare specialty stouts ever assembled in one place. The Festival of Dark Arts begins at noon and ends at 10 pm, pouring all over the Fort George campus in Astoria. You’ll be greeted with live music, roaming entertainment, and over 60 unique stouts on tap. There will be artisan demonstrations from the iron forge, tattoo artists, glass blower, ice sculptor, and stout servers. Delight in the fire dancers, tarot card reader, tintype photographer, belly dancers – and organizers say there will be even more.